Tai Chi, though it doesn’t look like it, is considered a martial art. 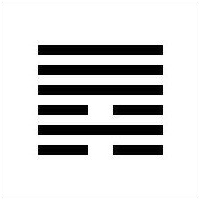 It is born of the same ancient Chinese philosophy that brings us the I Ching. When learning Tai Chi, students are not taught the martial applications of the intricately choreographed motions they are studying at all. Novices spend a minimum of a year in a slow and sometimes painstaking curriculum of simple motions strung together in an endless and flawless flow. After that, one generally spends a minimum of a second year refining the cycle one has now learned. Only at that point are more advanced forms, such as touch-hands and sword, are introduced, and the deliberate, slow-motion movements are applied to potential combat—even and especially combat with a much larger or more powerful foe. The key principle behind employing Tai Chi in a fight is never using offensive force to strike a blow, but instead keeping your center and getting out of the way of your opponent’s attack, channeling your opponent’s own force against him. It’s a really fancy and advanced way to beat someone up merely by getting out of their way, and it takes many years to cultivate it to a martial level. The primary attribute of the sixth hexagram is fighting, or conflict, but given their common philosophic lineage, it should come as no surprise that the hexagram is no “How to win a War” essay, but instead focuses on the best and most strategic ways to simply get out of the way. But when the two forces of cunning and strength come together in the world, fighting is simply bound to occur. Nevertheless, we are challenged with the assertion that fighting is only going to happen if we insist on our own correctness and refuse to meet our opponent halfway. So let’s say we know this and that’s what we do anyway, or maybe we feel like we have to our something. How do we maybe possibly win this cage match? The lines give us a few clues. First, if a violent problem is in its infancy stages, especially if it involves a much stronger enemy, see if we can just drop it altogether. It may still be a minor issue, but it’s possible that’s all it will be, and that’s to our advantage under these conditions. But maybe we can’t drop it. Maybe we’re still facing a much stronger enemy and there are no easy answers for engagement. Under these conditions, the wisest thing to do is retreat, and there’s no shame in doing it. If we do it before things get really ugly, we can avoid some of the problems of a direct assault. If we fail to retreat at all, and instead plunge on ahead, we will certainly be crushed, so let’s avoid that. We’re also told that, when under assault, we put ourselves in a stronger position by only ever taking credit for what we truly get and hold ourselves. If we’re benefitting from a position in the service of a powerful ally, or merely that ally’s helpful protection, it’s best to remain humble and give credit where credit is due—to our powerful ally and not our own strength. To do otherwise is to expose a vulnerability, but though they may try, no one can take away what is truly yours. Then there’s the flip side of this scenario, the one in which we’re the stronger party in the conflict. We’re not satisfied with the way things are, due to some grievance, and we seek to rectify it using war and defeating our enemy. The only problem is that we’re actually in the wrong, either in an overall sense or simply due to misaligned timing. Either way, the key is to recognize that what we’re doing isn’t right, and turn back. It might mean accepting conditions that we don’t find particularly agreeable, but we’re assured that such acceptance itself is what leads to the greatest peace. Also, under some circumstances, we’re told we may come across a capable mediator, and we are able to avail ourselves of him. If, in this scenario, we turn out to be in the right, the payoff is massive. But the last line leaves us with a grim lesson. This is the image of ourselves, having gone ahead with the war and fought it to the end, and won, and we feel joy…but the joy is entirely fleeting, as this path only leads to more violence. An ultimate victory using offensive force, in other words, is only inviting the next fight, and the next one, and on and on. Overall, the advice is to try and find that mediator if you can, and generally try to avoid starting any dangerous projects when you’ve got these other battles to deal with. Nevertheless, we are left with a way to avoid all of the conflict altogether—the ultimate way to get out of the way. It requires meticulous awareness and observation at the beginning. Identify the spiritual needs of those around you and harmonize with them, and from a practical and material standpoint, make sure guidelines are clearly set between all in the public forum. Using these simple (but difficult) methods, the warhead of the promised fight is diffused before it can even be loaded on a plane.